I love healthy recipes that taste delicious. That is certainly the case with these Curry King Salmon Kabobs. King salmon is renowned for its high omega-3 content, health benefits, and rich flavor. The curry and grilled veggies add a whole extra layer of flavor and you can devour these all by themselves or with some jasmine rice. In a small bowl, whisk together marinade ingredients. Place salmon, zucchini, red onion, and bell pepper in a baking dish. Pour in marinade and refrigerate for 15 minutes. Preheat grill or broiler at medium to high heat. Skewer salmon and vegetables and make sure to save the remaining marinade. Grill kabobs for 5-7 minutes, rotating once, until salmon is completely cooked through. If broiling, place kabobs on a broiler pan and broil for 12 minutes, turning once. While kabobs are cooking, boil the remaining marinade. Remove your kabobs when cooked and drizzle remaining marinade over them. Serve with whole wheat couscous. Salmon can be substituted for pasture-raised chicken. If using chicken, marinate and cook the chicken and vegetables separately. 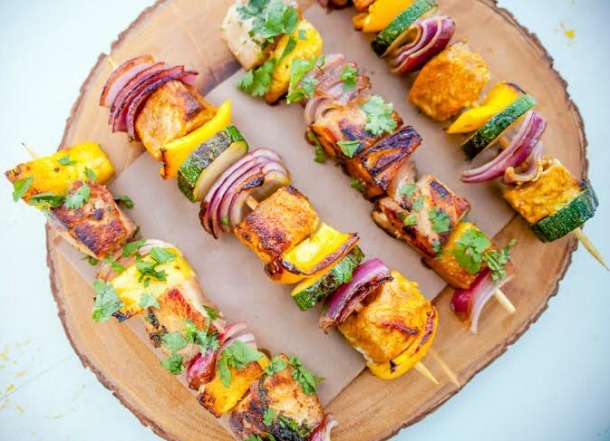 I hope you enjoy these Curry King Salmon Kabobs. If you enjoy curry, you may also enjoy this shrimp and red curry noodles recipe. What are your other favorite seafood recipes?